Jatiya Oikya Front on Thursday announced a 2-day programme, including demonstration wearing black badges and holding a public hearing, protesting what it said ‘vote robbery ‘ in the December-30 national election. 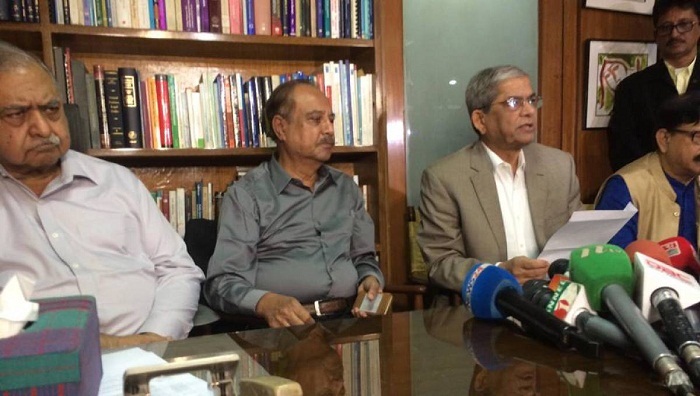 Jatiya Oikya Front spokesman Mirza Fakhrul Islam Alamgir announced the programmes after a meeting of the steering committee of the alliance at Dr Kamal Hossain’s Motijheel chamber in the capital. “Today’s Oikya Front steering committee meeting decided to hold a black badge wearing programme in front of the Jatiya Press club on February 6 protesting vote robbery on December 30,” he said. Fakhrul said the programme will begin at 3pm and conclude at 4 pm with the participation of Oikya Front leaders and activists. Besides, he said, their alliance will hold a public hearing with the participation of Oikya Front candidates and victimised voters on February 24. Fakhrul said they will later announce the name of the venue where the programme will be held.